On Sunday, we explored a small nook in Asia. 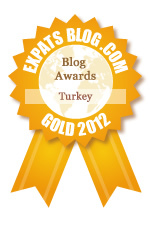 Living in Istanbul, that’s not difficult to do since the city is located on two continents - Asia and Europe. But it’s fun saying it. On the 15-minute IDO ferry ride from Beşiktaş to Kadıköy, we sat on the top deck so we could enjoy the view, albeit a bit chilly. You notice the juxtaposition of Istanbul’s skyline with its mix of century-old mosques, palaces of former sultans and deteriorating buildings amid the new high-rise apartment and office buildings. a toll on the goods they were transporting. Large freighters like this one often travel through the Bosphorus. The Haydarpaşa train station in Kadiköy, originally opened in 1872, but this building dates to 1909. Kadıköy is a large district on the Anatolian side of Istanbul. This bustling, middle-class district is located along the shore of the Sea of Marmara and faces the historic city centre on the European side of the Bosporus. Once we landed, we headed to the right to meet up with one of our expat groups, which had organized that day’s walk. The idea was to follow the path along the sea-front from Kadıköy, but we hadn’t planned on the rainy weather. We warmed up with a Turkish çay, bought a 5-lira şemsiye (umbrella) and decided to brave the elements. At one point, you could look back toward historic Sultanahmet and see the stormy clouds following us. But if you looked ahead, you could see the sun shining in the distance over the Princess Islands. Eventually, the storm did catch up with us and the whole group of us were fairly wet. So, we stopped for ice cream! I enjoyed a cone of pistachio and chocolate chip. The rain let up a bit, so we continued through the Fenerbahçe Marina where one section looked like a ship graveyard with various ship parts and deteriorating boats like the one below. However, around the bend, I saw a plethora of new sailboats waiting to cast off into the open waters. By now, the sun was shining, so we stopped to have a beer and chat. (You can see the continuing theme here, drink/walk, food/walk, drink/walk.) The stray cats nearby also took advantage of the sun, and I’m sure they were waiting for some tasty fish scraps. Our 3-hour 5k walk was coming to a close. I was a bit chilled to the bone and ready to be home snuggled up on the couch. We caught a dolmuş back to Kadıköy and took the next ferry home. We ended our day back in Beşiktaş with a dinner of Adana kebap, tomato-bulgur, yogurt and hot flatbreads. Not a bad way to end a Sunday.